The project involved planting of 150 native trees provided through the CommuniTree program, along both sides of the Route 9 paved bicycle trail within the City of Ranson. The goal of the project is to enhance the environmental, aesthetic, and public use functions of the Trail corridor through community based partnerships for tree planting and maintenance. The species were selected to provide all-season visual interest, wildlife habitat, shade, and effective screening of the highway and adjacent development The central feature of the project was the planting of 81 redbud trees. When mature, the trees will provide a spectacular show of mid-spring blossoms. The planting and advance preparations involved the following activities, which all took place on time and without incident! On Wednesday, April 10th, the Ranson Public Works augured the planting holes, delivered the trees and supplies from the nursery to the planting site. 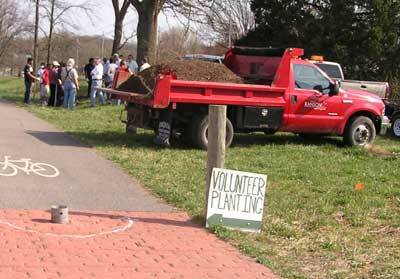 Thursday, April 11th was planting day. 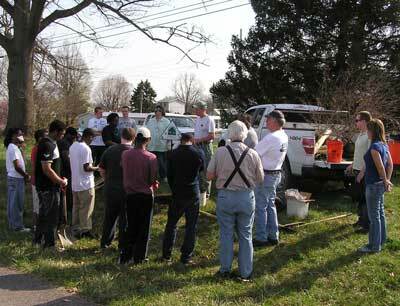 Volunteers from the Harpers Ferry Job Corps and Harpers Ferry Middle School received training in tree planting from CTree Liaison Herb Peddicord, Chesapeake Bay Forester with WV Division of Forestry. Reporters from the Spirit of Jefferson and the Martinsburg Journal conducted interviews, took photographs, and subsequently prepared interesting and informative articles on the event. Some of the volunteers also helped bag trash along the project corridor.